Land is a finite resource and is the basis for 90% of all human food, livestock feed, fibre, and fuel - and we are running out of it. Even worse, large amounts are degraded with only a third showing no signs of degradation, and a quarter being severely or very severely degraded. The economic implications of land degradation are vast and closer investigation of the costs involved in remediating degraded and contaminated industrial wasteland may reveal significantly higher costs, especially since large areas of industrial degradation have not yet been assessed. This book addresses the fundamental science and engineering of land degradation and rehabilitation from a multi-disciplinary perspective. The first part of the book discusses natural ground profiles dealing with soil science and the underlying geology, the functions of natural ground and ground engineering properties. In the second part three basic mechanisms of ground degradation are introduced: erosion, chemical degradation and physical degradation. 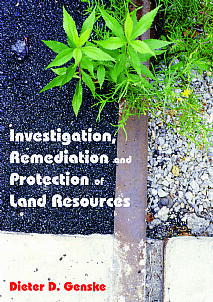 The third part addresses remediation, including strategies and techniques to investigate the ground and remediation measures. Finally, issues of land protection are outlined and a general strategy of sustainable land management discussed. With a firm basis in soil science and allied subjects, this book provides an eminently readable and thoughtful introduction for anyone in the area of land remediation, whether as a professional seeking an overview or a student requiring a broad perspective. Academics and students in regional and urban planning, environmental and geotechnical engineering, soil and environmental science and professionals dealing with the investigation and remediation of contaminated land will all find this book of great interest.